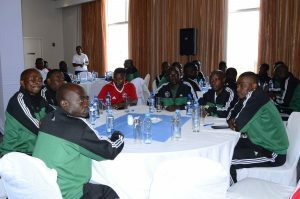 Barclays Bank and the Football Association of Zambia have held the first phase of the financial literacy workshop for five team quarterfinalists at Hotel InterContinental in Lusaka. Head of Marketing and Corporate Relations Mato Shimabale ran the players through the importance of managing their finances with 2012 Africa Cup winning captain Christopher Katongo giving a life testimony of his experience as a footballer. Shimabale urged the players to make having a bank account as their first step toward planning for the future. “We want to see you let the money work for you. Players receive bonuses so how do they manage that money that comes through?” he said. In addressing the players Katongo urged the footballers to be willing to sacrifice short term pleasures in order to invest in their future. In a straight talk fashion, Katongo shared how he gave up short term pleasures in pursuit of a lifelong career in football. “To be successful you have to first be willing to sacrifice, you are going to give up that Mosi maybe Zambian Breweries will make an even better brand of Mosi in future when you have bought yourself a house,” the former national team skipper said. Katongo urged players to invest whilst they were still in their prime as coaches shunned them once their age became advanced. “You have to invest when you are in your 20s when you still have the energy once you are over 30 coaches start looking the other way. I am talking about what I have experienced as a player and I am now a coach,” he said. FAZ Head of Competitions Julio Chiluba encouraged the players to take the financial workshop seriously. “You know some players who made money but today they are begging for a living. The process of learning how to save starts now,” Chiluba. The five participating clubs were Napsa Stars, Green Buffaloes, Lusaka Dynamos, Zanaco and Kabwe Youth Academy. Quarter finals will be held tomorrow at Nkoloma Stadium with Green Buffaloes taking on Napsa Stars in a lunchtime kickoff while Lusaka Dynamos and Kabwe Youth Academy will square off at 15:00 hours. Zanaco were granted automatic passage to the semi finals after Power Dynamos withdrew from the competition. On Wednesday Zesco United and Kitwe United will battle for the other semi final place when they face off at Nkana Stadium. Copperbelt based participants will have their workshop on Tuesday in Kitwe.